Mediterranean cruises are some of the best available, thanks to the fact that this area encompasses a number of amazing holiday destinations. Whether it’s Italian cruises or breaks to Spain, Turkey, Cyprus or one of the many other locations within this part of the world, Med cruises could be absolutely ideal for you. They’re known for being perfect for those after sunny holidays that involve lounging on the beach, visiting historical attractions and soaking up the local atmosphere at restaurants and bars, all the while enjoying the cruise ship’s onboard facilities. And, of course, with a cruise holiday, you can get the benefit of visiting numerous locations throughout the Mediterranean. We have all kinds of cruise deals for 2014 available too, so if you really do think cruises of this type would be perfect for you, why not check them out? This country is known for its fast pace, as well as its excellent fashion sense and footballing skill. Aside from this, it also has a delicious cuisine and some amazing wines for you to try, and will keep you interested throughout your stay. From dining on tapas to touring Barcelona, this city has it all. Take the time to stroll down Barcelona’s Las Ramblas, one of the central streets in the city that’s always alive with sights and sounds – the street performers in particular will keep you entertained! 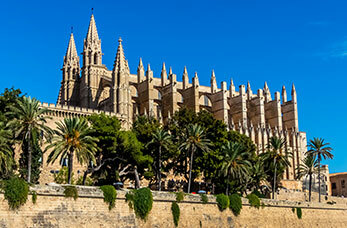 If you visit Palma, be sure to take a trip to La Seu, the 13th century cathedral. This historical building features Gothic architecture that will most definitely wow you! Italy is famous all over the world for its amazing architecture and laid back attitude, making it a fantastic place to visit during your cruise. There’s more than enough to see and do while there, including many touring attractions and enjoying some genuine Italian cuisine. 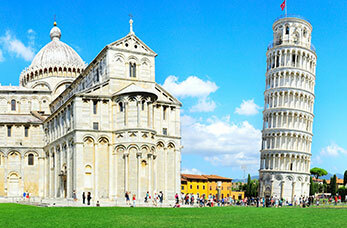 Take your very own holiday snap of you holding up the Leaning Tower of Pisa! Wander alongside the canals in Venice to go for an amazing walk in this astonishing city, or take a trip on one of the many gondolas! Try a spot of scuba diving off the coast of Sardinia to see the island’s underwater paradise up close and personal! Greece, with its startlingly blue coastlines and beautiful architecture, is a fantastic cruise destination, and many of the cruises we offer head there. 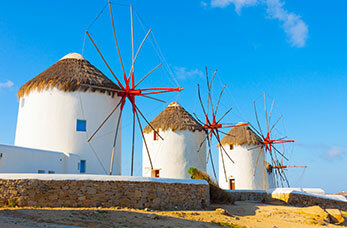 Greece’s islands are second to none and feature stunning natural beauty, alongside famous historical attractions. 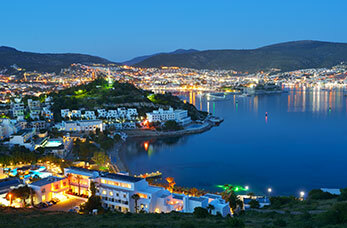 Turkey is unlike any other place on the planet, as it’s a wonderful mixture of European charm and exotic Asian culture. With its stunning coastlines, phenomenal beaches and breathtaking views, as well as the many tourist attractions within its town and cities, you’ll never want to leave! Wander through the Grand Bazaar in Istanbul to pick up some souvenirs, and be sure to barter with the merchants if you really want a good deal! Relax in Marmaris, the largest beach resort in Turkey! Croatia, with its picturesque views, pretty woodland and serene beaches will most definitely become one of your favourite places in the Mediterranean. 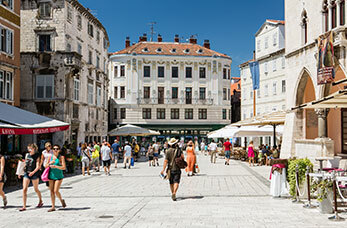 Cruises to Croatia are always a mixture of beautiful beaches, relaxing by the seafront and visiting attractions that are replete with history. Explore the walls of Dubrovnik – they’ve protected the city since the 7th century and provide amazing views both inland and out to sea! Check out the churches in Zadar, which include St. Donatus’ Church, St. Anastasia’s Cathedral, St. Chrysogonus’s church, St. Simeon’s church, St. Elijah’s Church, St Francis’ Church and St Mary’s Church! 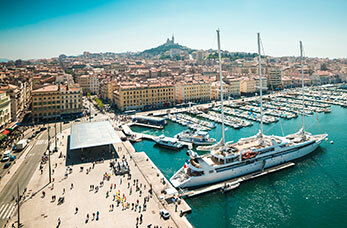 The French Riviera is one of the Mediterranean’s finest examples of relaxation. Packed with amazing sights and tourist attractions, everyone can find something excellent to do in this part of the Med. You can visit some of the more well-known destinations in France (such as Paris!) to experience the country’s glamour and chic style, or head for the more provencal areas to experience the ‘real’ France. The Mediterranean is filled with amazing places to visit, and going on a cruise holiday there can provide you with a wide range of experiences and memories. You’ll be able to find something for absolutely everyone when you choose cruises around the Mediterranean, and even if you haven’t a large budget you can still enjoy this fantastic part of the world thanks to our cheap cruises. Have you ever been on a Mediterranean cruise? If so, where did you head to? Or, are you just planning a cruise to this part of the world now? Be sure to let us know your thoughts by getting involved on Twitter – tweet us at @Cruisenation.